The defence experts on Tuesday said that Hizbul Mujahideen Chief Syed Salahuddin is an arrogant man, whom Pakistan should push back to India to let him face the consequences by the Indian Armed forces. "Salahuddin is arrogant to the ultimate and boastful. Pakistan should eventually push this man to Kashmir to lead a Jihad against India and let him face the consequences by the security forces," defence expert P. K. Sehgal told ANI. "Salahuddin says that he can do anything to India and Kashmir at his own choice and will, but little does he know that every all his boasts are of no use whatsoever," he added. Another defence expert Qamar Agha stated that India, since the beginning, has said that Salahuddin is a terror outfit and now the United States has also agreed to it. "Now he is posing himself as they can do whatever they want and therefore trying to uplift their status. The reason behind this is that they are somewhere afraid that Pakistan will abandon them. He is not some major leader, he is from Kashmir and therefore by trying to showcase his status as a big terrorist, he wants to seek support from Pakistan," Agha told ANI. Adding, "It is Pakistan's duty to arrest him and hand him over to India as because of him many innocent people have lost their lives. They are trying to create disturbance in Kashmir which will not be accepted by India at any cost." Salahuddin, who has been branded as a 'global terrorist' by the United States, admitted in a TV interview to having carried out terror attacks on Indian soil. "Till now our focus was on Indian occupation forces. All the operations that we have done or are underway, we focus only on the installations of these occupational forces," Salahuddin said in an interview with Geo TV. Asserting that Kashmir was his 'home', the Hizbul chief stated that the Valley was witnessing an uprising since the killing of Burhan Wani. Further revealing that he has many supporters in India, Salahuddin admitted to purchasing weapons from international markets, adding that he has the capacity to deliver weapons at any place if he is paid for it. Informing that he carried out many 'operations' in India, Salahuddin stated that the international scenario changed after 9/11. "If we would have taken our operations out of Kashmir at that time, India would get a chance to label Kashmir-e-Tehreek a terrorist organisation. We have support and we can target any place in India, at any time," he said. On June 26th, the U.S. Department of State designated Salahuddin, as a 'Specially Designated Global Terrorist'. "Department of State has designated Mohammad Yusuf Shah, also known as (AKA) Syed Salahuddin, as a Specially Designated Global Terrorist (SDGT) under Section 1(b) of Executive Order (E.O.) 13224, which imposes sanctions on foreign persons who have committed, or pose a significant risk of committing, acts of terrorism that threaten the security of U.S. nationals or the national security, foreign policy, or economy of the United States. As a consequence of this designation, U.S. persons are generally prohibited from engaging in transactions with Salahuddin and all of Salahuddin's property and interests in property subject to the United States jurisdiction are blocked," the State Department said in a statement. Salahuddin is the senior leader of the militant group Hizbul Mujahideen. 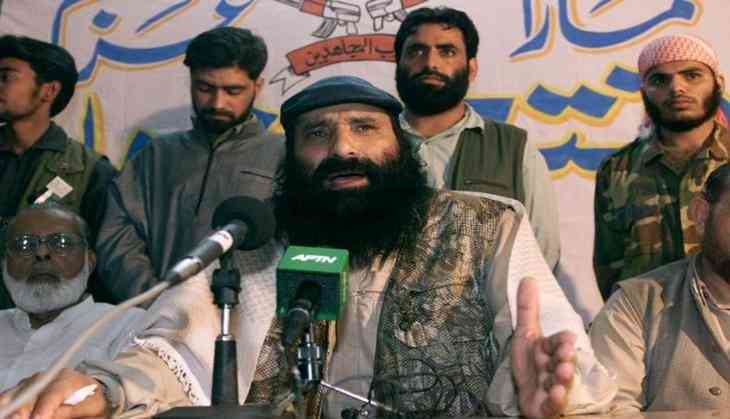 In September 2016, Salahuddin vowed to block any peaceful resolution to the Kashmir conflict, threatened to train more Kashmiri suicide bombers, and vowed to turn the Kashmir valley "into a graveyard for Indian forces."